Left to right, William Crist, Catholic schools superintendent; The Most Rev. Robert J. Cunningham, bishop of the Diocese of Syracuse; Carson Sorrell, clerk-of-the-works; and Sr. Anna Mae Collins, CSJ, principal of Notre Dame Jr./Sr. High School, tour the construction site of the Msgr. Francis J. Willenburg Center. Where there had always been lawn and a gravel driveway at the Notre Dame’s Jr./Sr. High campus, the school’s imposing new 14,000 square-foot building is taking shape. The new Msgr. 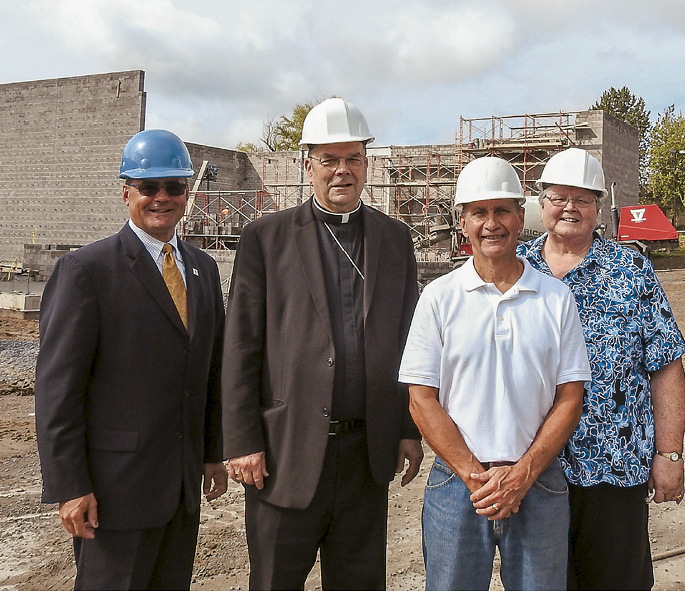 Francis J. Willenburg Center is the only new major construction project to take place in decades at any of the Syracuse Diocese schools. Msgr. Willenburg was often described as a “fix­ture” at local athletic events of all types and during his lifetime was inducted into many area sports halls of fame. While serving as parish priest throughout the area, his devotion to those of all ages was well known — from his service as a counselor for the Utica division of the Oneida County Children’s Court, to his support of Camp Nazareth, to a board member of Catholic Charities, to a founding board member of St. Joseph’s Nursing Home. In the spirit of Msgr. Willenburg, the center will enhance the experience at Notre Dame’s Campus for Catholic Education through arts, athletics and community events. The building features a multi-purpose design and will be a fully functional, independent space with a separate lobby and entrance. The school, founded in 1960, will now have its first stage to host performing arts events, such as musical theater productions, which historically have been held off-site. The Willenburg Center will provide much needed additional gymnasium space featuring a regulation-size basketball court and bleachers. A concessions area and warming kitchen, restrooms, locker and dressing rooms and office space are also in the plans. 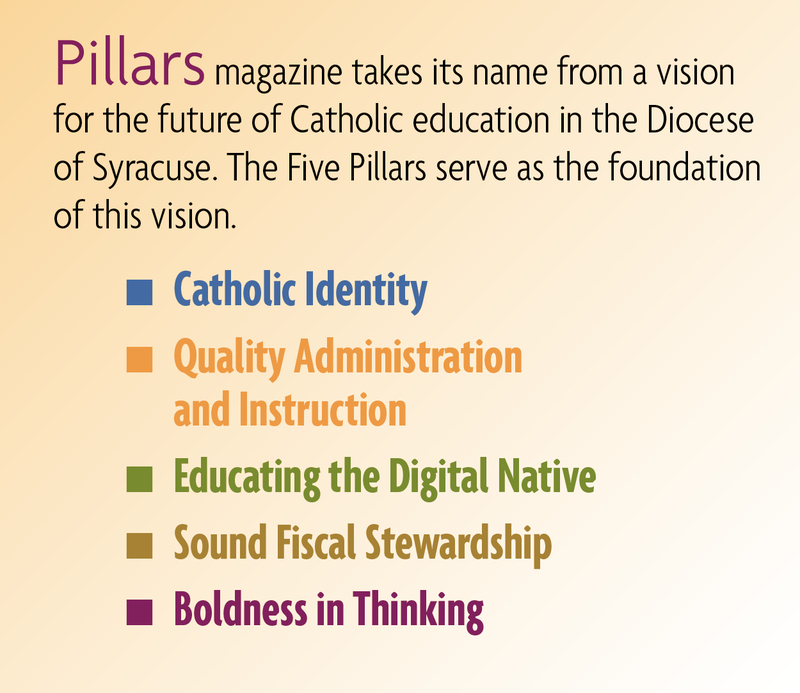 An early proponent of the project was The Good News Foundation of Central New York. The Good News Foundation’s mission and vision embody sharing the love of Jesus Christ especially through strengthening families and parishes. On this under-pinning, the nonprofit organization pledged a $4 million matching grant for the capital campaign. if they would raise a similar amount and we’ve done this in steps,” said Good News Foundation Executive Direc­tor Michael Buckley, Notre Dame Class of 1969. The new building is slated to be operational in time for the 2017-2018 school year. The project has been in good hands with many of those involved already part of the Notre Dame family. Several partners in the project, besides Murad, have their roots at Notre Dame. Joe Salerno, Notre Dame Class of 2000, is the owner of National Building & Restoration of Utica and is serving as general contractor. Clerk-of-the-Works Carson Sorrell’s children are Notre Dame graduates.